Welcome to the Time after time challenge! Our challenge was to remake an old project from the past. I dug deep....way back! I am a tad embarrassed to share this, mostly because its quite bad. And also? Because it says "oh pig poop". Wow. This was a farm fresh card gone wrong. I must have loved it at the time tho....oy. I don't own this set and dies just yet....it's on its way to me now, but I was SO lucky to meet Danielle this last week and stamp with her. 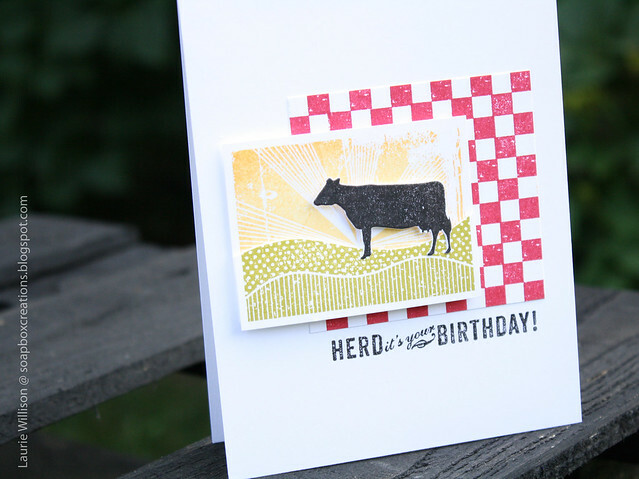 She was so nice to let me borrow her On the Farm set, to recreate this card. 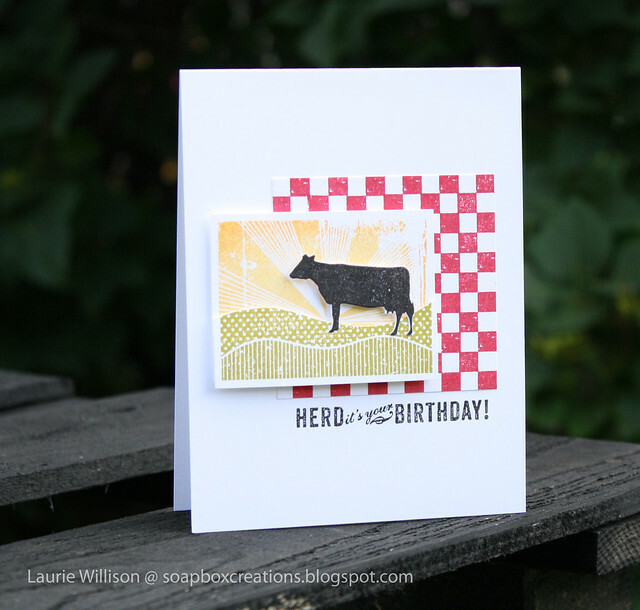 I stamped the checkered border in Pure Poppy to make the background piece. Then I stamped the sun rays in Harvest Gold with a top edge in Summer Sunrise. I stamped the lower panel in Simply Chartreuse and then cut out around the hills, so I could pop this up for some dimension. 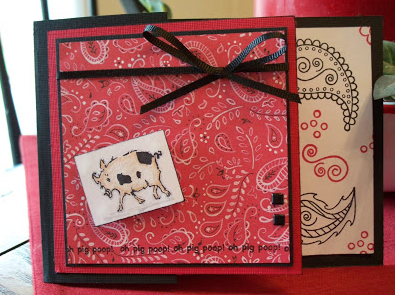 I die cut and stamped the cow and then added in a sentiment. I think I like this round better! :) My style has most definitely changed over the years and it really is fun to go back and see where I started. Even if the card does say pig poop on it. Ha! I can't wait to see what the other girls remake today! 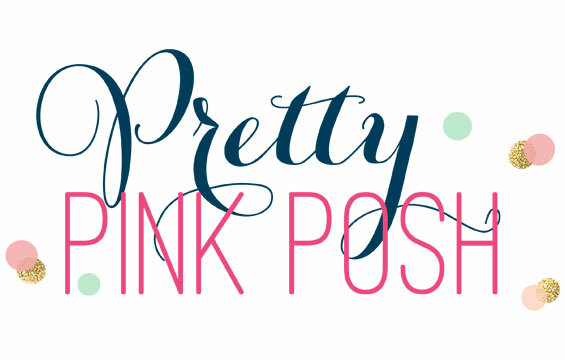 Here are their blog links so you can check them out too! 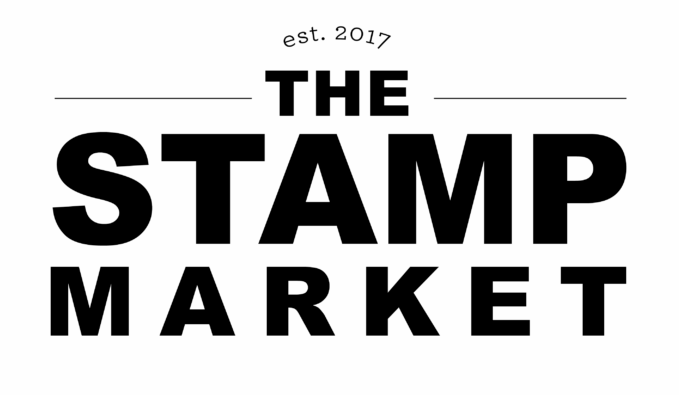 Hope your day at Stamp-a-faire has been so much fun. I have seen lots of amazing cards today and I need to go check in and see what else has been created this evening. I love the remake! Very modern. And, I too, see nothing wrong with the poop sentiment on your "old" card! Absolutely perfect, Laurie!! I love your old card too with it's corny sentiment. Ha ha!! It was so fun meeting you this week! I'm so happy I could join you all at the shop. What a contrast between the two cards. Your style has changed dramatically and I love it. Your new card is so cute. Nothing wrong with the old one, just not your CAS style! Love your remake. Some of my 1st cards were pretty awful. Not only do our styles change as we learn but there are so many more great products on the market now. The sentiment of the first card is priceless! You have definitely found a more refined style, and it's gorgeous! Love it! I think your blast from the past card is adorable! At that time we worked with what we had and I think it's great! Now move ahead a few years and you have found your style and let's face it we have so much more available to us now than ever. Who knows where we will be in another seven years but for now I enjoy your CAS style! I've gotta say, your card makeover is my absolute favorite! What a change! I love it. SAF Free Exclusive: Filled With Joy! My first Make it Monday! You Rock and some a NEW die! 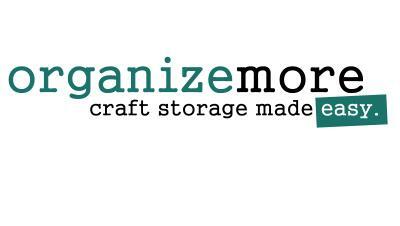 Operation Organization and some winners!